Both sector photometer and microphotometer analyses were carried out on the Hg spectrum transmitted by papers popularly used as window materials in Chinese homes. The intensity distribution of transmitted radiation, after normal incidence, through samples of twelve different kinds of paper has been studied, and the total transmission calculated for various wavelengths. 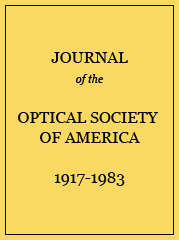 The total transmission of visible light (4354A) ranges from 38 percent to 72 percent, and of ultraviolet light (2967A) from 16 percent to 41 percent for the papers studied. Oiling the papers with vegetable oil (“tung yu”) increases the transmission by about 50 percent, at the same time narrowing the distribution curve and strengthening the paper against the effects of moisture. Fenlien 16.4 24.0 .064 .556 4. Shuang-er-pa 22.3 25.5 .081 .311 2. Paila 17.1 34.2 .029 .967 4.